With more than 20 countries possessing bountiful oil and mineral deposits, Africa is home to more resource-rich states than any other region in the world. If accountably governed, natural resource wealth could be a boon to a society, enabling valuable investments in infrastructure, human capital, social services, and other public goods. Yet, living conditions for most citizens remain dismal as a result of inequitable distribution of resource revenues. Natural resource wealth is also strongly associated with undemocratic and illegitimate governance. Roughly 70 percent of the world’s resource-rich states are categorized as autocracies. This pattern is not a coincidence. The steady flow of natural resource revenues funds the patronage and security structures these governments rely on to remain in power without popular support. Nearly without exception, Africa’s resource-rich states also exhibit high levels of public sector corruption. States heavily reliant on the export of oil and minerals, moreover, face a greater risk of civil conflict than their resource-poor counterparts. Contracts—often in the billions of dollars—between Queensway-affiliated companies and African governments are rarely made public. The syndicate’s leaders have forged deals found to be unfavorable to the respective countries as a whole by appealing to the short-term interests of those senior officials controlling their countries’ natural resources. Queensway’s collaborations with the governments of Africa’s resource-rich states have often failed to improve citizens’ living standards. Promised high-profile infrastructure construction projects regularly fail to materialize. Allegations of corruption among senior government officials who control natural resource contracts are widespread. Reputable extractive firms are cut out of the market, undermining the long-term health of the resource sector. And unaccountable governments are able to persist, propped up by the infusion of financial and material support to the regimes in power. 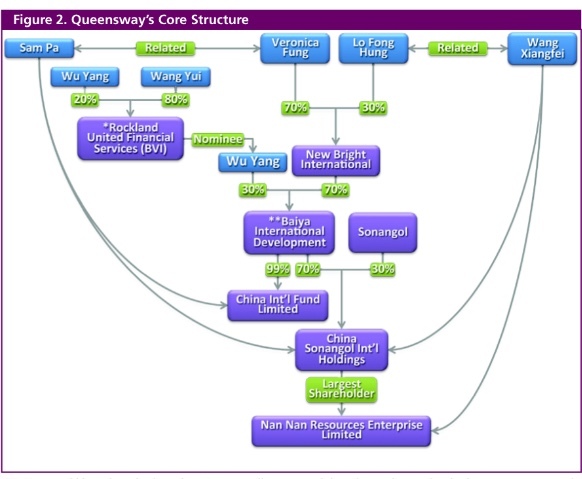 Queensway’s business model persists in Africa and elsewhere because of weaknesses in domestic and international oversight structures. First, at the national level, predatory investors operate in environments where the institutions needed to hold public officials and international corporations accountable are often absent. Second, failure by the governments of countries of origin (“home countries”) to regulate the overseas activities of corporations anchored in their jurisdictions helps these firms escape scrutiny. Third, the international legal and institutional framework for dealing with corruption and exploitation in the extractive industries by multinational corporations is deficient. The use of anonymous shell companies anchored in these jurisdictions prevents outsiders—potential business partners, banks, regulators, and law enforcement officials—from identifying who truly controls and benefits from the operations of unscrupulous corporations.